Senate reaches deal to avert "nuclear option"
The Senate on Tuesday resolved the protracted fight over a handful of President Obama's executive branch nominees, averting the Democrats' threat to use the "nuclear option" to change the Senate rules. Senate Majority Leader Harry Reid, D-Nev., and Sen. John McCain, R-Ariz., announced the deal on the Senate floor Tuesday morning. 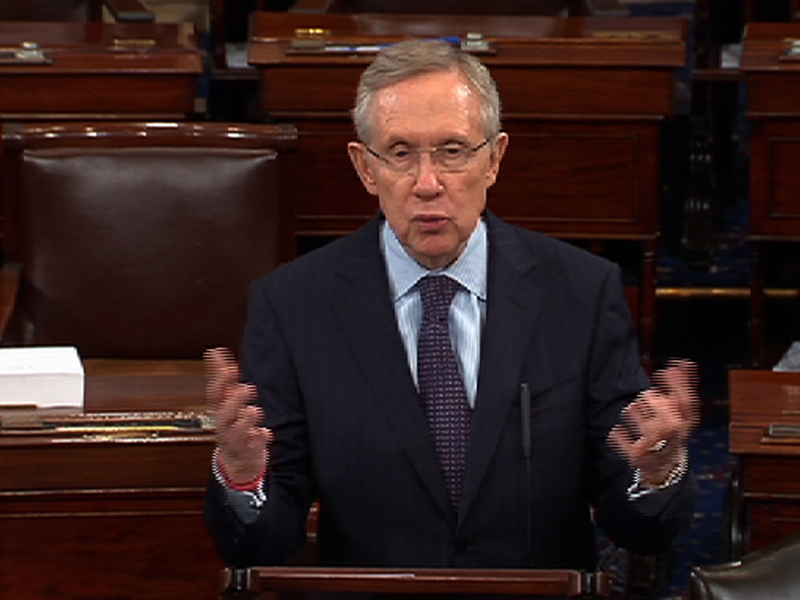 Reid said Democrats and Republicans worked out "a way forward that will be good for everybody." "I think we get what we want, and they get what they want," he said. "Not a bad deal." Reid had threatened to use the "nuclear option" if Republicans refused to drop their opposition to seven of President Obama's executive nominees. By Tuesday evening, the Senate approved Richard Cordray's nomination to lead the Bureau of Consumer Financial Protection, by a vote of 66 to 34. As part of the deal, however, Mr. Obama will have to drop two of his nominees to the National Labor Relations Board (NRLB) -- Richard Griffin, Jr. and Sharon Block -- and replace them with two new ones. Reid, McConnell bicker over "nuclear option"
Senate Minority Leader Mitch McConnell, R-Ky., told reporters Tuesday afternoon that the new nominees should go through the "regular order," which includes committee hearings on the nominations. He said he expects the full Senate to vote on the nominees before the Senate breaks for its August recess. The other nominees Reid wants to confirm include Mark Pearce, to serve as the NRLB chairman; Regina McCarthy, to serve as EPA Administrator; Thomas Perez, to serve as Secretary of the Department of Labor; and Fred Hochberg, to serve as president of the Export-Import Bank. While those nominees should be confirmed, nothing else in the Senate has really changed. "They're not sacrificing our right to filibuster, and we damn sure aren't [sacrificing] our right to change the rules if necessary," Reid said Tuesday afternoon. While little has practically changed, Reid said the compromise was an important step. "We've taken great strides to restore the comity and cooperation that used to define this institution," he said. If Republicans had refused to drop their filibusters to the nominees, Reid would have invoked the "nuclear option" -- a procedural maneuver that would force a rules change with a simple 51-vote majority. Reid wanted to change the rules so that executive branch nominees could be confirmed with a 51-vote majority. He stressed that the change would only apply to executive branch nominees -- judicial nominees and legislation could still be filibustered. Republicans and some senior Democrats expressed serious concern about using the "nuclear option," arguing that Reid should respect the rules put in place to protect the minority party. Reid and other Democrats, meanwhile, contend that the GOP's use of the filibuster against Mr. Obama's executive branch nominees is unprecedented and unreasonable. McConnell: "Collegiality" results instead of "nuclear option"
The entire Senate met behind closed doors for four hours on Monday night to try to hash out a compromise. "I think it's a step in the right direction that the majority has chosen not to exercise the nuclear option," McConnell told reporters Tuesday afternoon. "A high level of collegiality on a bipartisan basis was achieved last night. It was an important moment for the Senate." On the Senate floor Tuesday morning, Reid heaped praise on Sen. John McCain, R-Ariz., for leading the compromise effort with his "persuasiveness" and "persistence." "He does it at his own peril," Reid said. The meeting, McCain said on the Senate floor Tuesdasy, was "maybe long -- which is our custom -- but I think [a] productive discussion of the many issues that separate us." Mr. Obama on Tuesday evening released a statement saying he was pleased the Senate finally started considering nominees who have "waited far too long" for a vote. "Over the last two years, I've nominated leaders to fill important positions required to do the work of the American people, only to have those positions remain unfilled - not because the nominees were somehow unqualified, but for purely political reasons, he said. He thanked Senate leaders for forging a compromise and urged them to "build on this spirit of cooperation to advance other urgent middle-class priorities," like immigration reform and student loan interest rates.